Boyd Kenneth Packer (September 10, 1924 – July 3, 2015) was an American religious leader and former educator. He was the president of the Quorum of the Twelve Apostles of The Church of Jesus Christ of Latter-day Saints (LDS Church). Packer was born in Brigham City, Utah. He studied at Utah State University and at Brigham Young University. Packer was married to Donna Smith. They had ten children. He served as Acting President of the Quorum of the Twelve from 1994 to 2008, and was an apostle and member of the Quorum of the Twelve from April 1970 until his death in July 2015. 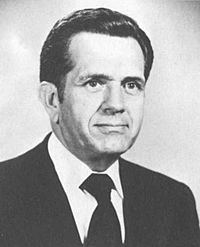 Packer has served as a general authority of the church since 1961. Before his death, he was the second most senior apostle among the ranks of the church. Packer died of natural causes at his home in Cottonwood Heights, Utah, aged 90. Boyd K. Packer Facts for Kids. Kiddle Encyclopedia.